To write is to be a risk taker! And taking risks in writing needs constant encouragement to build confidence. 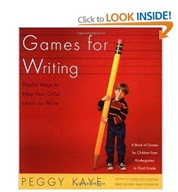 Teacher Peggy Kaye has written a book, Games for Writing,to help students overcome their hesitations to put pencil to paper. I like her writing games and activities as they are similar to the book making projects that I enjoy doing with my students. Games and book making projects put children in the right mood to learn and trigger their interest and alertness. They switch from dreading to wanting to write! Children become writers starting from a sheet with a few squiggles; to beginning to form their favorite letters and names of people who are important to them; to writing out their own journals, lists and stories. As children grow in their ability to rush out words as they write, letter formation and penmanship may take a back seat. Writing graceful letters is a wonderful thing to do, and getting their thoughts recorded on paper is the first step. Do the editing later! 1. Just for Starters: Try these 11 activities designed to ease Kindergarten and Grade 1 children into writing. Through games, they learn to control their pencils and produce properly formed letters. By listening to her story games, they learn to identify well-organized stories from semi-coherent stories. Examples: Letter reversals? No problem, give them more opportunity to explore and practice. Try the tactile experience of making Popcorn letters (gluing popcorn to a gigantic letter "J"). Or try using Pretzel dough to make alphabet letters- shape, bake and eat! 2. Stress Busters: Young writers can be nervous to put pencil to paper. Try these 16 activities designed to get a child giggling; nothing like laughter to calm a child's fears! These activities take small amounts of time to limit writing demands on children without limiting their imagination. Examples: Try Rhyme Time using words to create simple silly poems together in the A-B-A-B-A-B or AA-BB-AA patterns. Create your lists of rhyming words first together. Share the writing out of the poem. Or try Acrostic Poems, which work well using words/people/places that are important to your writer. A FUN one! Word By Word: Choose a title for a story with a group of students. Start the story together as a group. Then have each student contribute by rolling a dice/die and the number rolled is the number of words each child will add to the story! 3. Bugaboos: Try these 9 playful ways to improve spelling, handwriting and grammar. Examples: Mixed-up and Missing: For grammar, try covering the student's eyes, writing out a full sentence, cutting it into separate words, mixing up the words and say to your student: "Open your eyes! What do you see?" They see a lot of mixed up words and their job is to sort them out to make sense. You can give clues to help! Or try Traveling Words: Turn handwriting practice into a funny sentence. Normally, you would write it on a straight line, but not in this game! Draw a winding/ weird road across the paper and your student writes the sentence as neat as he can on the road line. Traveling words is more rigorous than you may think! 4. Writing with Style: Ahhh, time for writing more sophisticated stories! This section of her book includes 8 activities which encourage students to create unusual fictional characters, mature in their notions of story structure and select new vocabulary to express their ideas. Example: Egg Carton Tales: Use 3 half egg carton sets (6 holes). In the first "setting" set, write out 6 different story settings (a forest, a pirate ship, a tree fort, a school, a King's castle, an island). In the second "character" set, write out 6 characters. In the third "problem" set, write out 6 different story problems. Have your student shake a coin in each of the cartons. Where the coin is when you open the carton, that determines the setting, character and problem. Help your writer tell and make up a story to match their egg carton choices. Telling stories with these elements will eventually transfer into writing a complete story on paper. 5. Made with Pride: When it is time for longer writing projects, 30 minutes or so, try the 8 writing activities in this section. Some of these will be done over several different writing sessions over many weeks. Example: Shape Books: Children often perk up when they get to write in a new or unusual shaped book! If your child loves Cats, make a cat shaped book with construction paper covers and lined paper inside. When it is important to the writer, he or she is motivated to get writing! -Try a game and see if it motivates your child. -Children's tastes change over time; so one activity that did not work in January, may work in May! -Play an effective game over and over, as many times as your young writer likes! -Be generous with your compliments and encouragement. -Show you are delighted with the Risk-Taking your young writer is doing!